Cystic fibrosis is an inherited disorder that causes life-threatening damage to the lungs and digestive system. This disorder is caused by a defective gene that affects the cells that produce mucus, sweat, and digestive juices. Instead of the secreted fluids being thin and slippery as they should be, people with cystic fibrosis experience thick and sticky secretions that clog up tubes, ducts, and passageways, which can be especially dangerous around the lungs and pancreas. Cystic fibrosis will require treatment for the rest of your life, but the sooner treatment begins, the better your outlook will be. Here are the most commonly used tools for diagnosing this condition. It is now required in the United States to screen all newborns for cystic fibrosis, so treatment can begin immediately after birth. Generally, this test will consist of a taking a blood sample to be checked for elevated levels of IRT (immunoreactive trypsinogen), a chemical that is released by the pancreas. However, in some circumstances, such as a stressful delivery or a premature birth, the IRT levels might be elevated for other reasons. If this is the case, other tests might be required to confirm the diagnosis of cystic fibrosis. This is a test that involves applying a sweat-producing chemical to the skin and then collecting the sweat to test for higher levels of salt, an indicator of cystic fibrosis. The sweat test can be used to check infants who are at least one month old, or older children and adults who weren’t screened at birth. If you or your child is experiencing nasal polyps, chronic sinus or lung infections, male infertility, pancreatitis, or bronchiectasis, then your doctor might recommend the sweat test to check for signs of cystic fibrosis. This test involves taking a blood sample to be checked for specific gene markers that will indicate what type of cystic fibrosis you or your child is suffering from. Your doctor might want to take an X-ray of your chest or your sinuses to help see the extent of the damage that cystic fibrosis is causing. Chest X-rays will show whether your lungs are scarred, inflamed, or trapping air. Sinus X-rays will show signs of any complications from cystic fibrosis, such as sinusitis. This is a test that measures how well your lungs are able to deliver oxygen to your blood. Lung function tests look at how much air you breathe in and out and how fast you are able to do so in order to determine the overall health of your lungs. This is a test that involves your doctor taking a sample of your spit (sputum) and examining it to see if there are any bacteria growing on it. 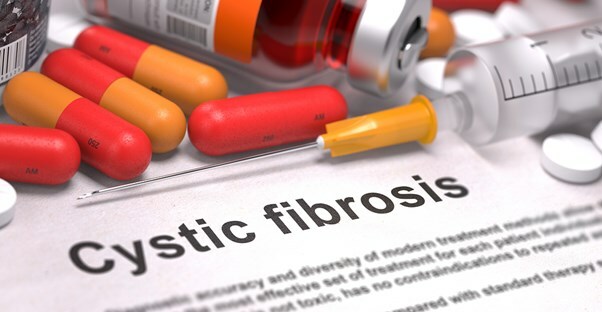 This can help determine the type of cystic fibrosis you have, since a certain type of bacteria called Pseudomonas indicates a very advanced type of cystic fibrosis that requires aggressive and immediate treatment.